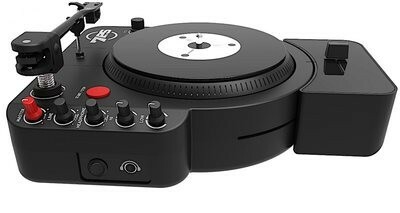 Portablism, or the art of taking battery-powered scratch DJ gear out and about with you so you can perform routines "on the go", is apparently huge right now (although we've yet to encounter it in the wild in Digital DJ Tips land). And the 7PS turntable - over a year on the drawing board and now ready for a final push before becoming a reality - is the most purist bit of kit the scene has seen yet. Far from being a cheap plastic box, hacked together to just about be fit for purpose, the 7PS has been designed by "people who know", from the ground up. It's for enthusiasts, by enthusiasts, and that kind of thing is something we here at Digital DJ Tips love (we are huge fans of the utterly superior Minirig speakers, for example - come to think of it, they could find a place with fans of portablism. Anyway, I'm sure one glance at the picture of the turntable at the top of this article will tell you if this is something that you're interested in getting behind - and if you are, you can find out more about this worthy, independent and currently embryonic project over at the 7PS GoFundMe page. Have you caught the portablism bug? Do you like the look of this turntable? Share your thoughts below..